•	Are you experiencing ear-splitting noises or rattling sound from your kitchen extraction fans? •	Do you find your kitchen fans to be abnormally cacophonous? 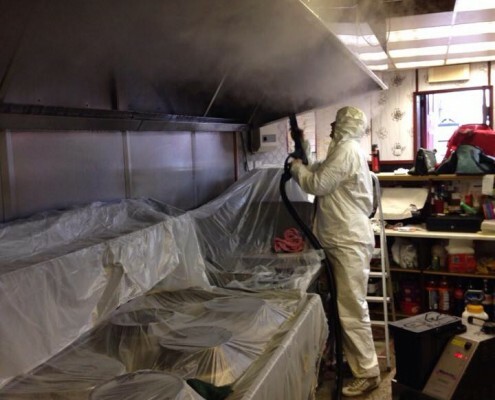 •	Is the calmambiance of your restaurant getting spoilt due to the smelly and noisy environment of your kitchen? •	Do you want to offer a healthy and the best working environment for your staff? If theseissues are bothering you, then it must be acted upon immediately.As rattling noise indicates that your fan is not able to perform properly. Kitchen extraction fan is the "first line of defence" for the health of the kitchen. As a result,the chef and other staff won't be able to concentrate to produce amazing dishes to woo the customers. So, youwilleventually lose business. Sometimes self-cleaning is not enough, you must hireprofessional Kitchen fan cleaning and removal services to take care of these issues. Loud noises are alarming in naturebecause it indicates that your extraction fans are not cleaned properly.Fans in kitchen extraction systems are not only crucial forpurifying the bad smoke or odour but also to create asafe working environment for all the members. But extraction systems can break down easily. •	The primary reason for the noise is an accumulation of dirt and greaseand it acts as an unbalanced factor. •	Foreign objects stuck within the fan orimmobilized blades. •	Worn out bearings of the extraction fan due to lack of maintenance. How Can We Help You With the Kitchen Fan Cleaning and Extraction System? We always start our process by unplugging and separating the filter or else we switch off the circuit. During the job, we open the windows of the kitchen for better air circulation. After separating mesh filters, our specialists put them into the sink and clean with boiling water. It aids to slackenthe grease. To eradicate the grease properly we separate the mesh filters and frames. After that, we immerse these components in a mixture of ammonia and water for hours. Then our team indulges in scrubbing and complete cleaning. We also dip the frames and scour them clean.Lastly, we leave them to dry. Cleaning process doesn't only include a filter, it also involves fan blades as well. We use a blend of trisodium phosphate with the solution to make them squeaky clean. Before using this, we always take permission from our client if they are comfortable with the chemicals or not.Otherwise, we use a blend of baking soda, warm water,and ammonia. After cleaning the fan blades, we also clean the fan by removing its bolts and hinges. After purifying and cleaning process are complete, our team of experts places the filter, fan blades and mesh to dry. Then using the proper hinges kit,we attach the necessary components of the fan only after they are entirely dry. So, the kitchen exhaust fan is ready to use. After we provide kitchen fan cleaning and extraction services, we always provide a comprehensive report to our clients. We take help of TR/19-standards gauge measurements to deliver industry standard best extractions services in the UK. The report includes necessary photos before and after service as well as an inspection report.